Low Shear – High Volume Mixers with Counter-Current Technology. Lancaster Products L-Series counter-current mixers are equipped with hi-torque, low shear, rotating plow blades. 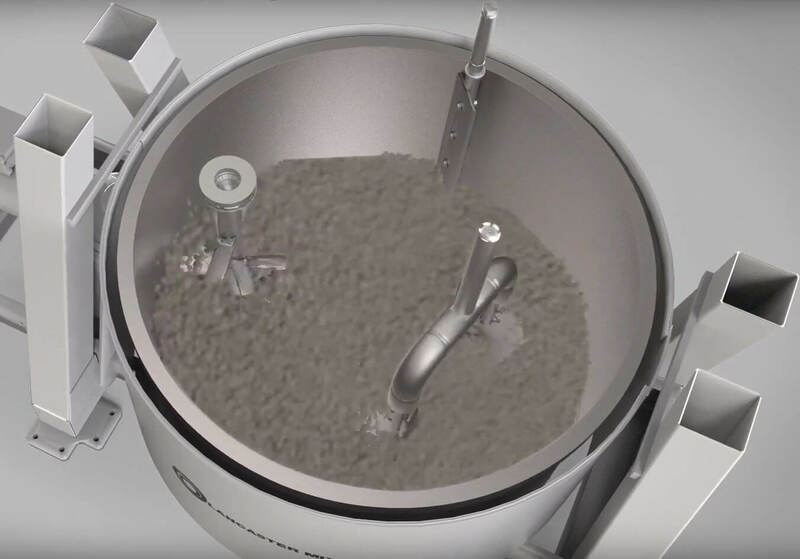 The L-Series mixer can come with muller wheels as an option, which combines a kneading, rubbing, or smearing action of a mortar and pestle along with the intensive mixing of the counter-current system. L-Series industrial mixers can be manual, fully automatic or a combination of both and can be used for research, testing or production. Lancaster Products engineering staff can assist in selecting the appropriate mixing tools depending on the characteristics of the materials to be processed. When mulling action is desired, the mulling wheels are adjusted above the mixing pan bottom to clear the largest grain size. This feature prevents particle size change or destruction. The counter-current mixing action of the Lancaster Mixer is widely accepted as the most effective technique for consistent uniformity and thoroughness. Simply stated, counter-current action occurs when the pan rotates in one direction, while the mixing tools rotate in the other. The rotating mixing pan conveys the material to the counter-rotating tool assembly. This results in countless cross-over of layers with maximum particle travel both vertically and horizontally, without depending on free fall. Depending on the material and application, mulling can be an important addition to mixing. Equipping Lancaster Mixers with muller assemblies imparts a kneading and smearing action of a mortar and pestle needed for some applications such as foundry sands, along with the intensive mixing of the counter-current system. Look to the Lancaster Products L-Series Mixer for advanced techniques for mixing solids or solids with liquids. Lancaster L-Series low-shear mixers can be adapted to process dusty, abrasive, corrosive, highly viscous or explosive materials and can be used for research, testing or production. Lancaster Products L-Series counter-current industrial mixing equipment can handle materials from powders to pastes – regardless of differences in particle sizes, shapes, weights, and hardness.